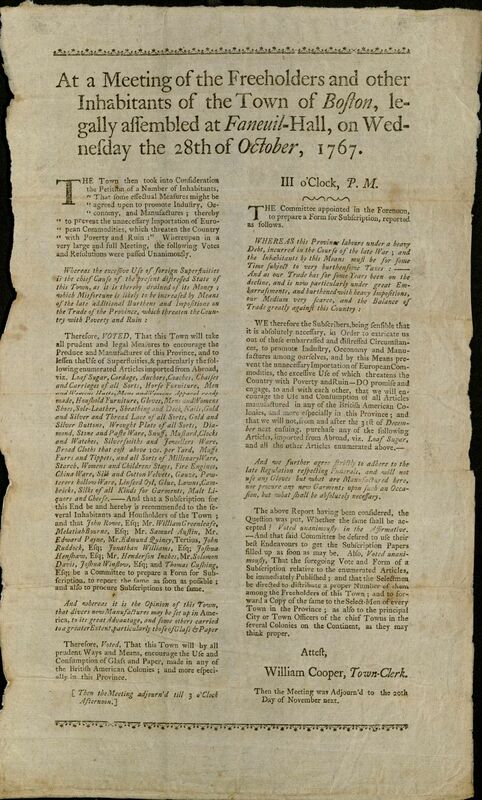 Update: These documents have now been fully digitized, and are available here. Although the overwhelming majority of Houghton’s collections are well-cataloged, a few things that slipped through the cracks in the conversion from the card catalog to an online catalog still lurk on our shelves. 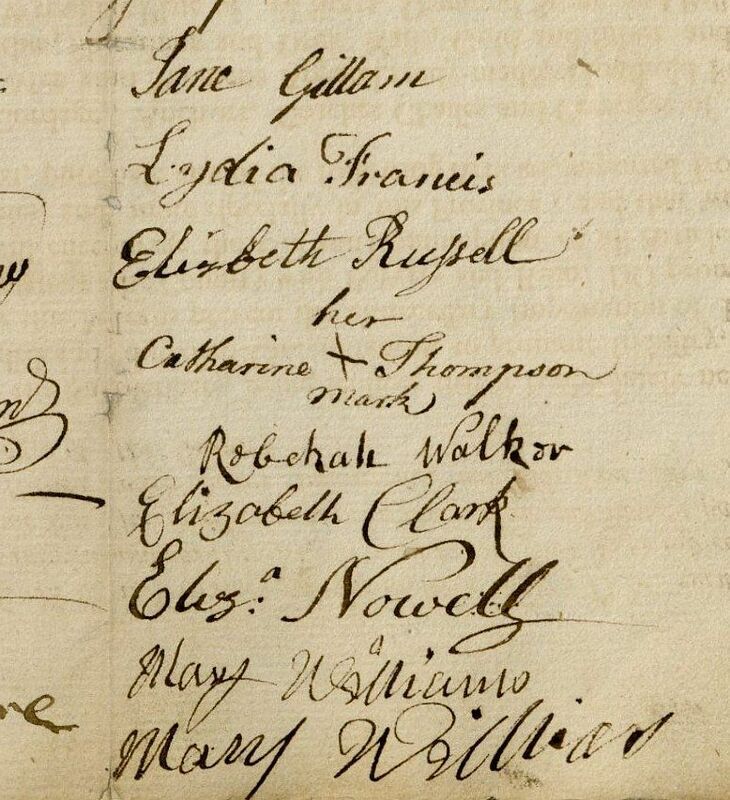 Karen Nipps, Head of the Rare Book Cataloging Team, recently discovered such an item, one of tremendous importance that offers crucial new evidence about the stirrings of revolution in Colonial Boston. In 1767, Parliament passed the Townshend Acts, named for Charles Townshend, Chancellor of the Exchequer. 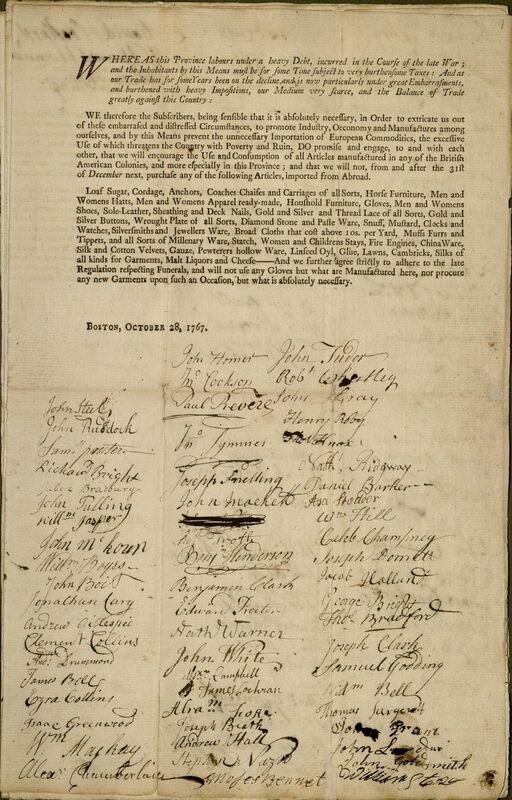 The Acts were a series of taxes intended to raise revenues from the colonies to pay for the British troops stationed there, and to pay the salaries of colonial governors and judges. Lacking any representation in Parliament, the colonists protested the taxes the only way they could–by refusing to purchase the goods imported from Britain on which the taxes had been levied. said Committee be desired to use their best Endeavours to get the Subscription Papers filled up as soon as may be. Also, Voted unanimously, That the foregoing vote and form of a Subscription relative to the enumerated articles, be immediately Published; and that the Selectmen be directed to distribute a proper Number of them among the Freeholders of this Town. 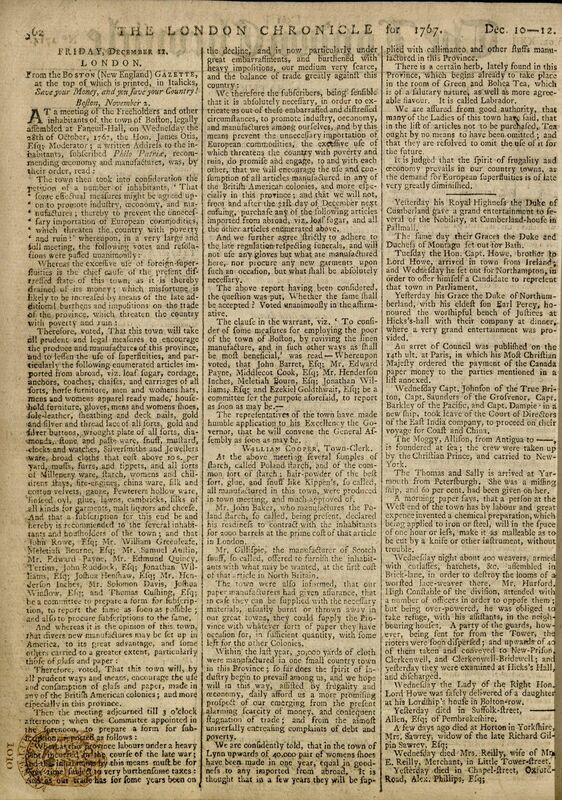 News of the non-importation pledge quickly reached Britain, appearing in the December 12, 1767 issue of the London Chronicle (click to enlarge; the piece begins at top left). 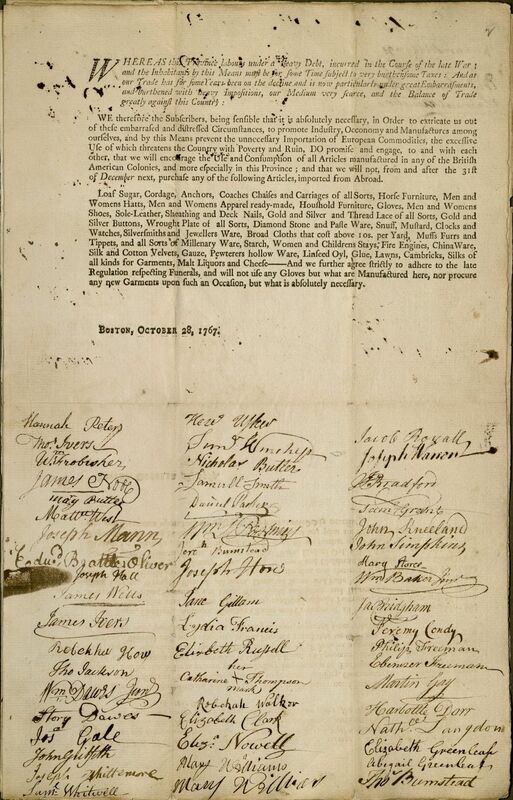 Although the non-importation agreements, lacking an enforcement measure other than moral suasion, failed to cripple British imports, they persisted as a colonial protest against taxation, culminating in the Boston Tea Party. As this is one of the earliest such agreements, we’re very glad to make this important discovery available to scholarly study. 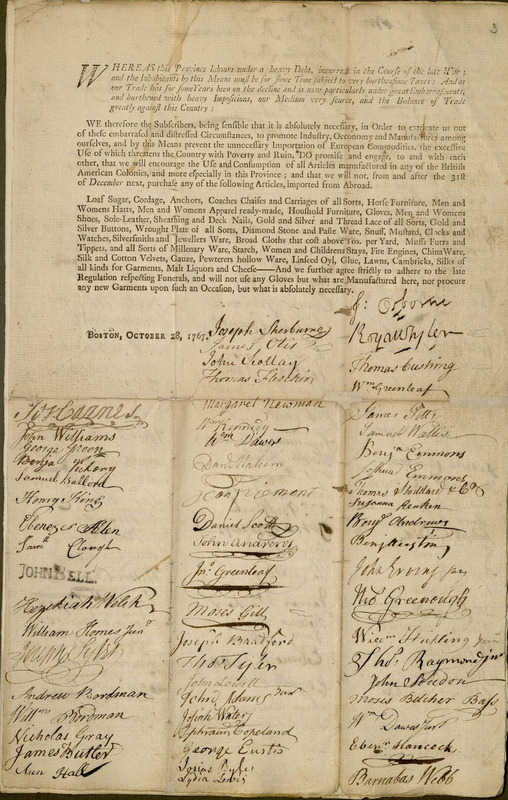 Can you please post the entire document including all of the signatures? Thank you!!! Yes, we hope to be able to do so soon. Please check back to the Houghton Blog–we’ll post an update when the full document is available. Interesting reference to ”Canada paper money“; wonder if it is Upper or Lower Canada currency. 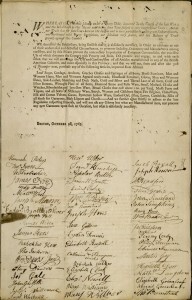 So how did a *printed* petition text arrive at the meeting at Faneuil Hall? There must have been at least one prior meeting by, er, instigators . . . . Or did one at the meeting rush to the nearest printshop? It would have taken around an hour to set the type, but printing it would have taken but minutes. Where exactly was this wonder found? My guess is that the petitions were separately circulated around town after the meeting was held to agree upon the text. That would explain why some sheets are nearly full with signatures while others have many fewer. These documents were found in the Houghton stacks in a section of materials that were accessioned in 1942 (the year we opened) but not given permanent call numbers at the time. We’re checking through the rest of that section now to find any other stragglers that need cataloging. Was a lead being followed by a patron or staff, or was it just dumb luck? Was the significance recognized immediately? We’ve been working on a longterm project to locate any remaining uncataloged materials, and this came up in the course of that project. There wasn’t much description on the catalog card for this item, but once our head rare book cataloger saw it, she immediately knew it was an important find.